For public screenings: conferences, events, classrooms, panel discussions, etc. This 23-minute version is specifically geared toward those such as educational institutions, protective and professional agencies and associations, service providers, senior centers, and so on, who wish to use it as the foundation for, or as part of, educational and/or informational events, including events with admission fees. This extended film contains everything the 23-minute version has, plus two additional case studies, and it examines reverse mortgages (a particularly formidable quagmire seniors often get caught up in). Again, perfect for the same institutions and agencies, for use as the foundation for, or as part of, educational and/or informational events, including events with admission fees. The above 'buy now' links above are for the NTSC version of the film, available for buyers in the US and Canada. 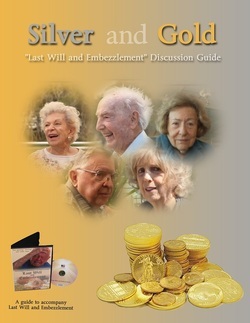 This book, “Silver and Gold – “Last Will and Embezzlement” Discussion Guide,” was developed as a companion piece for the ground-breaking documentary to facilitate objective & intelligent debate & discussion for key issues surrounding the financial exploitation of the elderly, including victim profiles, the challenges of our present legal system, the modus operandi of the perpetrators, the effects and symptoms of these crimes, as well as potential solutions to this ever-increasing worldwide problem. NEW — SPECIAL PROMOTION: TWO NEW COMBO PACKAGES! One copy of the 23-minute ‘scholastic’ version of “Last Will and Embezzlement” PLUS one copy of “Silver and Gold – Last Will and Embezzlement Discussion Guide,” together in a combination package. Purchase both and save. One copy of the 83-minute ‘chaptered’ version of “Last Will and Embezzlement” PLUS one copy of “Silver and Gold – Last Will and Embezzlement Discussion Guide,” together in a combination package. Purchase both and save. After clicking on Buy Now, you may sign into your own PayPal account or you may choose Pay with a Debit or Credit Card. Sorry, no refunds. Exchanges on defective materials, only. Must return with original packaging.